The weekend of the 19th -21st June, a group of staff and volunteers from the IBA Program dropped into southwestern Manitoba for a weekend committed to prairie birds. Manitoba Important Bird Area Program Assistant, Marshall Birch gives us the lowdown on day 1. On Friday, June 19th, IBA Program Coordinator Tim Poole and myself headed Westward on a weekend trip to the Southwestern Manitoba Mixed-Grass Prairie IBA. We were joined by Christian Artuso and Bonnie Chartier, both memebers of the Manitoba IBA Program Steering Committee and skilled birders. This particular IBA has been the key focus for our work this summer. 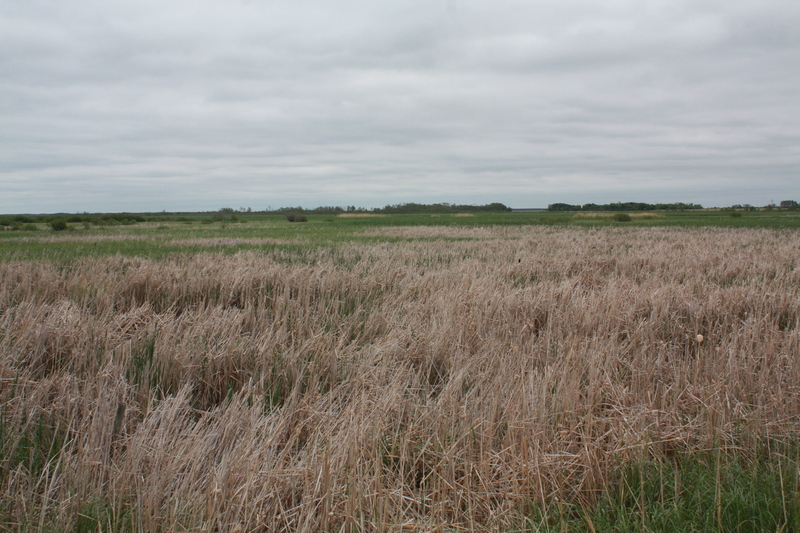 The area itself is unique as it is the only IBA in Manitoba that specifically focusses on grasslands, while most other IBAs focus on marshes, lakes, and other wetland areas. 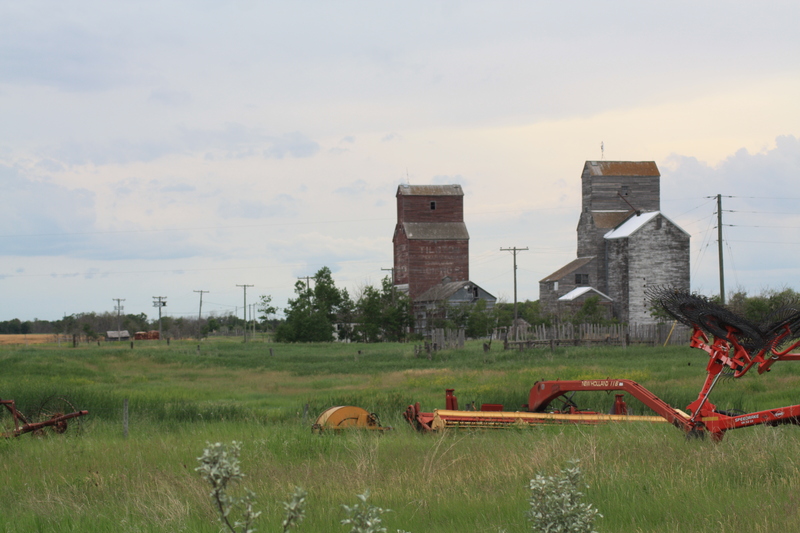 The Mixed-Grass Prairie also happens to be one of the province’s most threatened ecosystems, which means the species which rely on it may also be at risk. We had a few key goals for the trip. We had arranged to meet with a group of local landowners on Saturday morning to take them on a bird-watching outing, to share information and raise awareness about local species and their potential threats. We also had a mission to accomplish which would ensure that the area be designated a globally important bird area. That was to take place Sunday – more about that later. For today our goal was simply to get there, find the house we’d be staying at, and maybe take a look around the area. Since Christian and Bonnie were busy receiving their Partnership Award for the Manitoba Breeding Bird Atlas at the Manitoba Service Excellence Awards, we didn’t hit the road until around three PM, arriving at our weekend home in Tilston around seven. Manitoba Conservation had rented out a house in the town for Colin and Carla, who had been working in the area collecting data on plants, birds, toads, mussels, and other threatened species. On the way we made a quick stop by Douglas Marsh, just South of the Number 1 Highway and East of Brandon, to see if we could call out the elusive Yellow Rail. We failed of course, given that it was early evening and the Yellow Rail is mostly active at night. A nice side-trip, anyhow, with a few Bobolinks and various waterfowl around to see and hearing the unmistakable calls of Manitoba’s other 2 species of rail, Virginia Rail and Sora. Just before entering the IBA itself things really picked up. 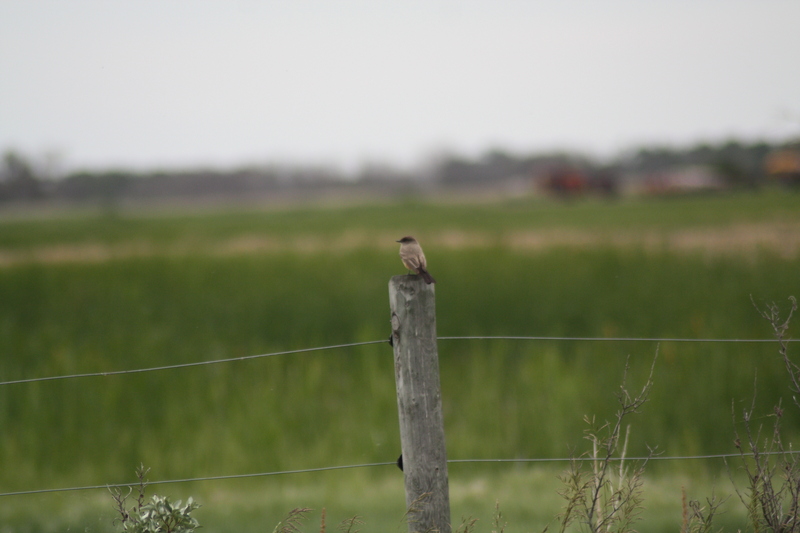 Christian had been given the heads-up on 2 spots for Baird’s Sparrow just east of Pipestone. We stopped to listen and rather than the expected Baird’s Sparrow we were serenaded from on high by 2 Sprague’s Pipits, an endangered species for which our trip was partially geared towards. We also saw fleeting glimpses of a pair of Upland Sandpipers, a Grasshopper Sparrow, and a Clay-Coloured Sparrow. 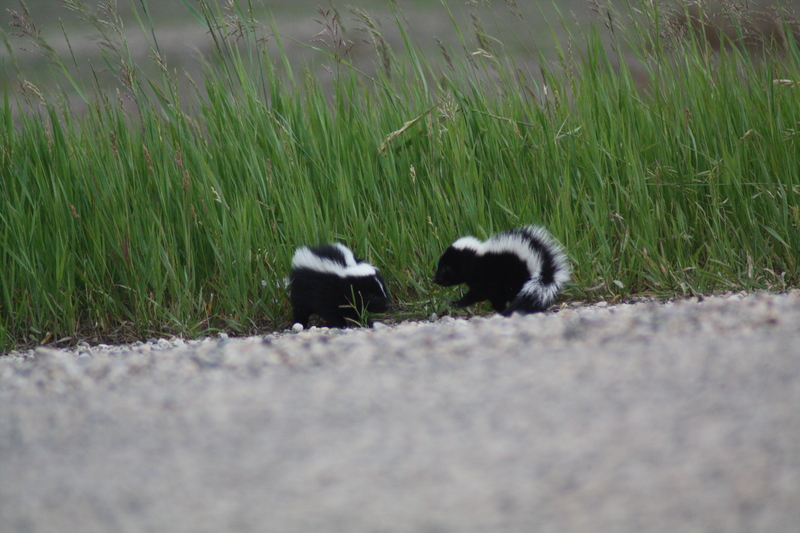 These, along with a variety of hawks, waterfowl, gulls, and songbirds, made for a good start to the trip, especially when capped off with a sighting of a pair of baby skunks. Upon arrival, Tim and I opted to camp in the back yard to avoid cramping the somewhat minimal space available. I managed to stay dry despite rain throughout the weekend, and enjoyed a nightly concert of birdsong. We had a few hours before the sun set so we decided to take a look around the area. I would be hopeless attempting to map out where exactly we’d gone, but we had some information on where to find specific species, so we set out in search of them. No more Sprague’s Pipits were found, nor did we encounter any Chestnut-collared Longspurs, the other major endangered species we were looking for, though after some twists and turns we were able to find some abandoned houses which provided habitat for a couple of Say’s Phoebes and Barn Swallows. Both these species populations have been in steady decline in recent decades, most likely due to a loss of nesting areas (predominantly abandoned barns, houses, sheds, and other buildings), and due to changes in insect population brought on by the use of pesticides and general habitat change. The Say’s Phoebe in particular was one we had all been hoping to see. Other species seen on our journey before turning in that evening included: many Canada Geese, Gadwalls, Mallards, Blue-winged Teals, Shovelers, and Wilson’s Phalaropes; a few other waterfowl including American Wigeons, Green-winged Teals, Redheads, Lesser Scaups, Ruddy Ducks, Double-crested Cormorants, and American Coots; shorebird species including American Avocets, Killdeer, Willets, Lesser Yellowlegs, Marbled Godwits, and Wilson’s Snipes; a host of passerine species including Western Meadowlark, Western and Eastern Kingbird, Horned Lark, House and Sedge Wrens, American Robin, Cedar Waxwing, Common Yellowthroat, Yellow Warbler, Vesper Sparrow, Savannah Sparrow, Song Sparrow, Orchard Oriole, and American Goldfinch; as well as Red-tailed and Swainson’s Hawks, American Kestrel, Northern Harrier, Great Blue and Black-Crowned Night Herons, Northern Flicker, Black Tern, and hundreds of Franklin’s Gulls. Not a bad start! It was time to be sung to sleep by Great Horned Owls, Soras, and the occasional cat-fight down the street.